Homepage. This page: Old illustrated invoice featuring a solid-tyred lorry. Motor Haulage & Carting Contractors. This interesting old invoice turned up in 2006, some 81 years or so after it was written out. 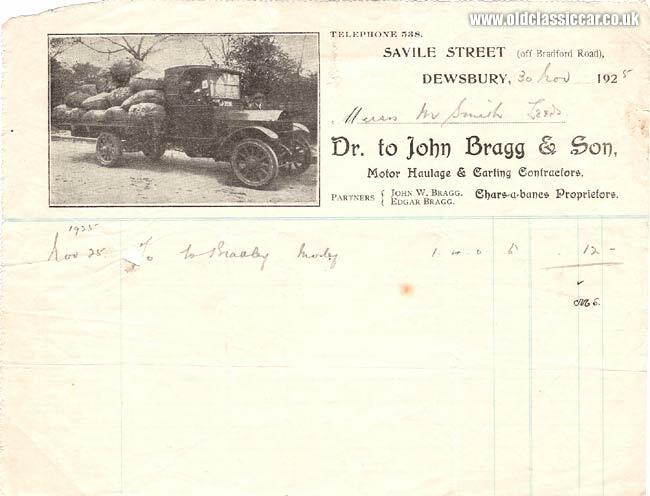 This particular invoice was issued by a Mr Smith, of Leeds, who, it would appear, was a driver to John Bragg & Son, who were Motor Haulage and Carting Contractors in the 1920s. The paper is super-fragile and looks like it was torn from a pad, so its quite surprising that it survived at all. Bragg & Son were located on Savile Street (off the Bradford Road) in Dewsbury, a town in Yorkshire. The named partners in the business were a John W. Bragg, and Edgar Bragg (presumably father and son). They also operated one or more char-a-bancs, offering tours around the lanes of Yorkshire and to seaside resorts at a guess. Deciphering the handwriting on this invoice is less than easy. It looks like the destination was Morley, a town near Leeds. I can't make out the rest of the description, other than the date of November 25th, 1925. If someone could suggest a manufacturer of the lorry shown, I'd be interested to hear from you. The board on top of the cab advertises the Bragg name, with the vehicle's registration number beneath the screen. Sadly the latter is partially obscured by one of two brass lamps fitted to the scuttle (note - no headlamps fitted to the front wings as on later commercial vehicles). Some level of protection from the weather is offered by the cab roof and doors, although there was still plenty of opportunity for rain to blow in to the lorry's cab and onto the driver via the open sides of the 'C' cab. Drivers of modern lorries and vans don't know how easy they have it, with air con, CD players and efficient heaters!! 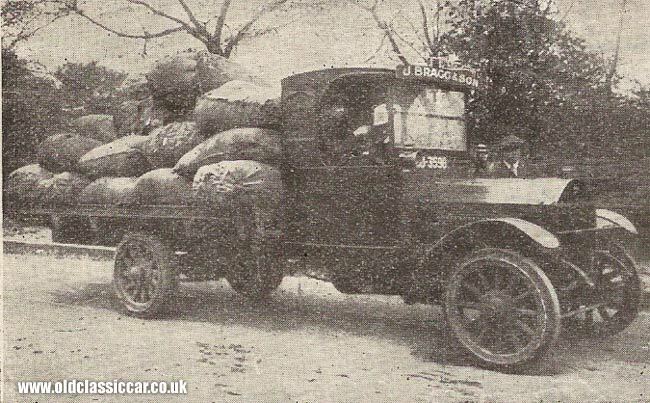 The ride would have been decidedly rough in this lorry - note the solid rubber tyres, and wooden-spoke wheels. The condition of roads in the 1920s were nothing to write home about either, with many thoroughfares being little more than rough tracks, with few featuring properly finished road surfaces like we have today. This flatbed vehicle was photographed with a hefty load on the back, the rear springs are well flattened. Just visible in the cab is a driver, and on the far side someone stood facing the camera - presumably the two business partners. Below is a clearer picture of the lorry, scanned from the original document.